Hi all! TSheets in Idaho checking in for #QBOChat! Hello, Gary from @ledgerdocs joining in for the #qbochat. 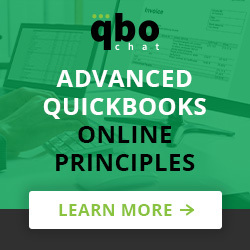 RT @QBOchat We invite all types of @QuickBooks users – #smallbiz, accountants, developers, and more to join our #QBOchat. @PattiMart5 @ledgerdocs @QBOchat That’s what I’m talking about. Can I get in on the #QBOchat pizza party? @sammy3042 @ledgerdocs @QBOchat Pizza every meal!? #QBOchat ? @BizBooksCloud Looking forward to seeing the updated branding! Are you going to do a #QBOchat reveal?! @BizBooksCloud Love the subtle cloud at the bottom. #QBOchat feels extra special to be part of your big reveal! #qbochat, better late than never! Matt from Verenia here, checking in from Austin, TX. @CathyIconis Just did a quick google … looks interesting! A3: One of my favorite reports is Income by Client Summary. Shows exact expenses associated with clients/jobs. @QBOchat Thanks! I can see how that will help! Any other requests for #QBOchat stickers for laptops? The first 5 people that message me your address this week, I’ll mail out. @MeganTarnow @UseTallie They used to participate in #QBOchat‘s years ago!! We’d love them back! Turn Stream buffering off in settings. RT @clocpa OK…for all the #qbochat ppl, tweetchat isn’t loading tweets. Just a few minutes left for this week’s #QBOchat. Do you all have any suggestions on how to make #QBOchat better?